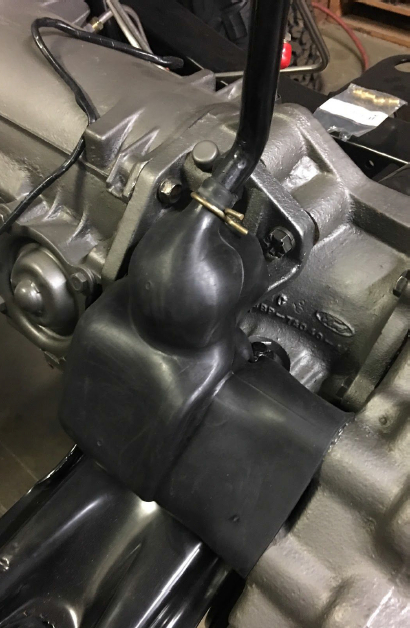 Our next product for May is a lower J-shifter transfer case boot for a 1973-1977 Ford Bronco. This boot, manufactured by Dennis Carpenter Industries is an exact reproduction of the original. This boot, made from oil resistant rubber, is what slides over the shifter and helps keep dirt out of the shifter pivot and shift rails and comes with the clip that goes around the rod to hold it in place. We have plenty more Bronco and Ford Truck parts that we’d love to show you as well. We’ve got you covered with hundreds of the best and hardest-to-find parts at the best prices. At Bronco Graveyard, our selection of maintenance and replacement parts for your Bronco or Ford Pickup is second to none. And we’re adding more all the time.